Bow Street Flowers — We're on our way! Well, we're squeezing in a 24 hour vacation on Martha's Vineyard. We caught the noon boat. The water is calm, the air is crisp and clear...just like it was on our honeymoon where I froze to death on Lucy Vincent Beach. We were enjoying the beautiful skies and chilled wind left by the outer remnants of hurricane Andrew. I'm hoping for slightly warmer water, but what the hay? I can't think of a better place to get away for an overnight. More photos later. 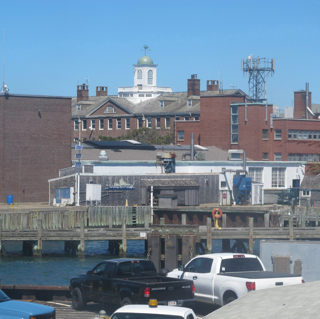 This is Woods Hole from the boat. Bye bye!